Halloween has come a bit early this year! 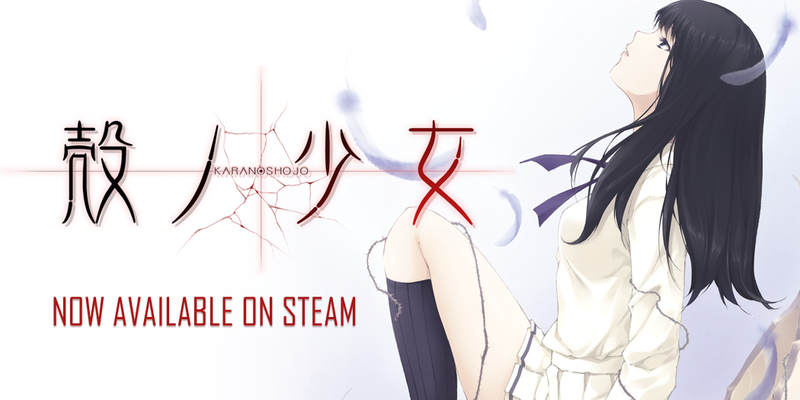 MangaGamer has announced that Kara no Shojo is now out on Steam. This is the uncut version of Innocent Grey’s adult murder-mystery, and it can be yours for the low price of $24.49. This includes a launch discount of 30% that is good till October 28th. Tokyo; a metropolis finally starting to recover ten long years after Japan’s defeat in the War. Private eye Tokisaka Reiji accepts a strange request from a girl in Inokashira Park. Meanwhile, a series of bizarre murders is plaguing the area, one where young women are disappearing, only to turn up dead and maimed with their wombs torn out. Seeking assistance on the case, Detective Uozumi Kyoko called up his old friend and former co-worker, Reiji. Ouba Girls Academy; a school on the outskirts of Hoya City. Reiji’s little sister attends this school, where two young women have mysteriously vanished. Saeki Tokio, the vice principal, calls in Reiji to investigate their disappearance, giving him his third case. Reiji infiltrates the academy as a substitute teacher to glean information from the students—but that’s when he meets her once again. The body count continues to rise. What should be a simple search for some students is starting to grow out of control. For some reason, the number of missing people and unidentified bodies don’t match up. Who will be chosen as the next victim? As the endless cycle of tragedy continues, what mysteries lie behind these new cases? Behind a similar series of murders from six years ago? Innocent Grey presents an original, psychologically thrilling mystery for your pleasure. Here, your investigative work and deductions directly influence the course of the story. Will you be able to use the clues contained in your notebook to piece together the truth in this pulse-pounding mystery thriller? With a cast of more than thirty characters, there’s no shortage of complicated relationships, drama, and riddles. You may let out a scream. You may be this close to letting the killer get away. But what every you do, don’t let this amazing work slip under your radar!